Thanks, Liz, for asking me to contribute to a topic that is at the heart of what I do. This is why I wrote the book, “The Boomer Burden – Dealing With Your Parents’ Lifetime Accumulation of Stuff” and “How to Divide Your Family’s Estate and Heirlooms Peacefully and Sensibly”. I want to educate people to avoid the harsh and painful reality of fighting and hurt that comes when families have to divide a parent’s possessions. Thank you, Liz, for bringing attention to this topic with such clarity and insight. Welcome to those new visitors who are linking to my blog from Liz’s article. There are over 100 weekly posts here full of valuable insights about all areas of personal property. Check out the categories on the right, and sign up to receive my weekly blog. While you are there, you can click directly to Amazon.com and order my books in either print or ebook versions. A year ago, I wrote a companion guide for my best-selling book, The Boomer Burden. It was titled “A Boomer’s Guide for to Cleaning Out Your Parent’s Estate in 30 Days or Less.” Last fall, I began to review the material and realized that I could make a good book … EVEN BETTER. Be the first to read and benefit from … How To Clean Out Your Parents’ Estate in 30 Days or Less. The original contents are almost entirely unchanged, but I have added more information, more advice, and more assistance to my readers. In the revised edition, I have added more content on the actual cleaning out process. How do you prepare for those tiring days of cleaning out? What must be done first? How do you handle all the photos and papers that you will uncover in the home? Like any inportant project that you undertake, you need to have two very important things ready: SUPPLIES and STRATEGY. We discuss both. Together, we do the Cleaning Out of the house one room at a time, beginning with the attic, and ending with the last box packed and the last bag dragged to the dumpster. I give you everything you need to know to clean each area of the home, just as if I was with you on this project. If you expect to deal with your parents’ home soon, or you know someone who is anticipating this difficult challenge, please read my book! Cleaning Out your parents’s home can be done in 30 days or less with the right plan and preparation, and I want to help you accomplish this. Simply click on the book title at the right under “Books By Julie” to link directly with Amazon. com and order yourself a copy. Better yet, get a copy for each of your siblings. It’s best to be prepared before the crisis hits, when grief and stress overcome the family. Here’s the sneak peek from my new book, How to Divide Your Family’s Estate and Heirlooms Peacefully and Sensibly, available at the right side bar of this blog. Problem: Two of my siblings are fighting over the same heirloom. How do you split that? Solution: When two or more are arguing over the same item(s), you have a few options, but ultimately it is up to the level of stubbornness of the people involved. One heir simply turns the other cheek and forfeits to the other. Rememeber that all of the values need to be kept equitable. If Sue gets a $5,000 item and Barbara gets a $200 item, that is not equitable and other arrangements must be made, whether in cash assets or other items, to make up for the $4,800 deficit. One sibling can offer to buy the item from the others and take it out of their inheritance. They can write up an agreement and share the item, if it is small enough to share. Then again, this decision only postpones that inevitable decision for later in life. When the siblings die, now their children have to contend with the same issue. If no one can agree and the arguing continues in a “no one is going to give in” pattern, I recommend the executor sell the item through an appropriate auction and split the proceeds by the number of siblings. Yes, the siblings will be upset, but that is more acceptable than resenting each other the remainder of their lives. What would mom or dad want? Would they permit this kind of treatment towards one another? In most cases, the answer is no. They would be disappointed, having trusted you to make decisions that they probably should have made while they were alive, but for whatever reason, they didn’t. You can’t go back; you can only go forward. So go forward, knowing what your parents would have wanted and go forth doing what they would have wanted. 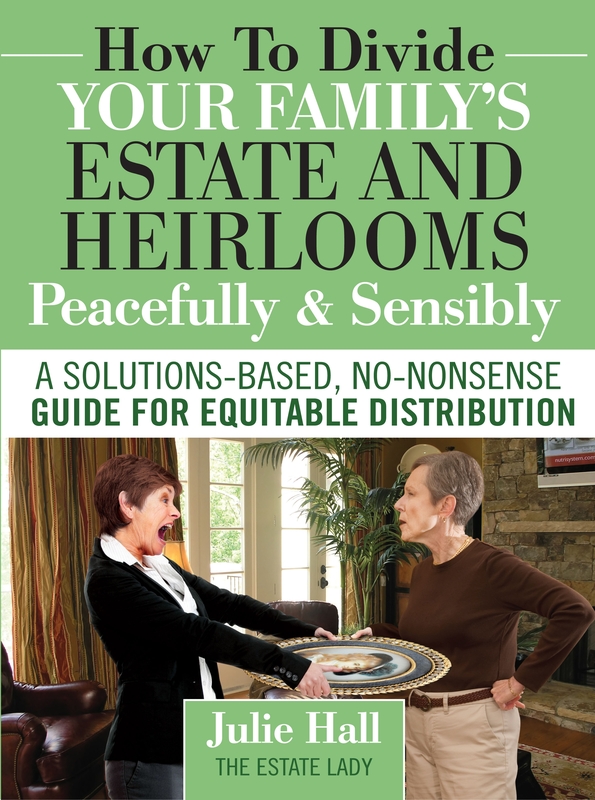 How to Divide Your Family’s Estate and Heirlooms Peacefully & Sensibly is the only book that walks you through the relational minefield that happens when children/heirs have to divide the personal belongings of their parents. This is a must-have resource packed with practical expertise and a fair, equitable process for dividing personal property within a family estate. From how to minimize fighting and manage the emotional roller coaster that comes with a loved one’s loss, to understanding legal responsibilities and suggestions for executors, this guide offers solutions based on decades of experience in working with families and estates coast to coast. Those of you who have read my first and second books, or read this blog for very long, know that I want to educate you. That’s my goal! There is a lack of information out there that frankly handles the problems and challenges of dividing the estate contents equitably and without fighting. I want to create helpful and very practical guides that cut through to the essentials, and give you all the tools to educate yourself and then do the task effectively. My new book is available now on Amazon.com. Here’s the link and it’s also available on the right side bar of my blog: http://www.amazon.com/Divide-Familys-Heirlooms-Peacefully-Sensibly/dp/0984419128/ Watch my blog for a sneak peek of the book next week! Again this year, I’ve helped people understand the necessity of preparation before death, and helped them avoid battles over stuff after death. I have accumulated a wealth of understanding after nearly 20 years of experience handling personal property in estates. My book, The Boomer Burden — Dealing With Your Parents’ Lifetime Accumulation of Stuff, provides practical and effective steps for liquidating and distributing your parents’ assets in a way that both honors them and promotes family harmony. You’ve probably heard the stories: arguments over stuff, an inheritance lost forever when parents are scammed, siblings estranged, or an adult heir taken from daily responsibilities for months while trying to empty their childhood home. Amazon.com carrys my book; you can purchase it in time for your family’s holiday celebrations. If you have a close relationship with parents and siblings, you owe it to all to keep harmony in the home after the unexpected death of a parent. If there are difficult relationships, distance between you and your parents, an accumulation of stuff in your parents’ home, and other thorny issues, please buy a copy of this book and save yourself even more pain and struggle. One of the most distressing, yet integral parts of estate planning and liquidation is the division of personal property; who gets what? A vital conversation now can go a long way to prevent squabbling between the heirs after mom and dad pass away. For peaceful resolutions and wonderful guidance, please order The Boomer Burden. It has earned wonderful reviews, and it makes a great gift for siblings, parents, children, even clients. This is my Christmas gift to your family: a wealth of information and valuable resources to protect the relationship, sanity, and peace among your family. The joy of preparation for the inevitable, and the kindness of knowing that everything is in order. Merry Christmas! Today, I’m giving you another look at the practical content of my new book, A Boomer’s Guide to Cleaning Out Your Parents’ Estate in 30 Days or Less. This book is a carry-along guide, full of practical checklists and worksheets, and so much wisdom from my 20 years of experience in this field. Click on the link to the right of this blog entry to get your own copy. Buy one for each of your siblings too! Knowing all the people who may have assisted your parents with the above paperwork may help you locate it. Important papers are often stashed in unusual places. Consider these locations when going through the home in search of paperwork and important documents. How to empty the family home without losing your mind! That’s a concept that every Boomer should value, and this book gives you all you need! Since it begins with a section on “One or Both Parents are Living and Still in Their Home”, you’ll be able to use this guide immediately and keep using it until you actually have to clean out the home. 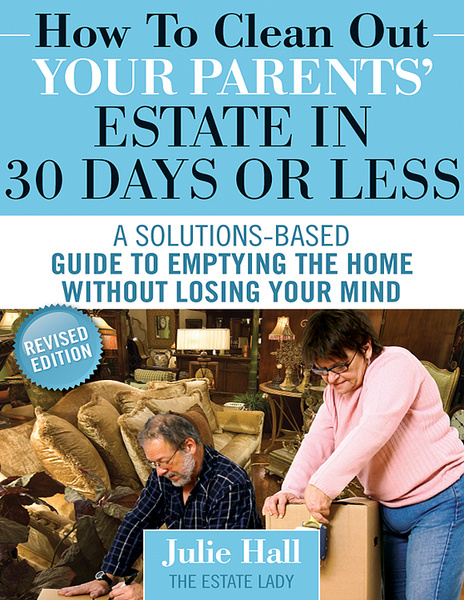 A Boomer’s Guide to Cleaning Out Your Parents’ Estate in 30 Days or Less is now available online in print. It is soft-bound, like a workbook, with 82 pages. Every Boomer with retired or elderly parents should have a copy of this book! Please buy this book before the crisis so you’ll be prepared and armed with knowledge, resources, and guidance. To buy from Amazon.com, simply click on the link to the right of the blog under “Books By Julie”. The book is also available through Barnes & Noble online. I’d love to hear your comments here at my blog, but especially, on Amazon and Barnes & Noble. Thanks! “A Boomer’s Guide to Cleaning Out Your Parents’ Estate in 30 Days or Less” is finally ready! It is currently available as an e-book which you can download and print out (http://www.booksonboard.com/index.php?BODY=viewbook&BOOK=686132). Within the next two weeks, it will be available in print also. I’ll include an update here on my blog when it has been released in print. More than a “How-To” guide, A Boomer’s Step-by-Step Guide to Cleaning Out Your Parents’ House in 30 Days or Less is a “What To Do, When, and Why” take-along manual packed with meticulously compiled checklists, resources, and information. You are given logical, easy-to-follow steps so that you can literally clean out your parents’ house in less than 30 days. Best of all, you are given advice from a nationally acclaimed expert who has “seen it all” on how to do this for your own peace of mind and keep everyone’s best interests at heart. Separate sections of this book cover practical checklists and resources to use when your parents are living and still in their home, when one or both parents are in failing health, and when parents have died and the estate remains. 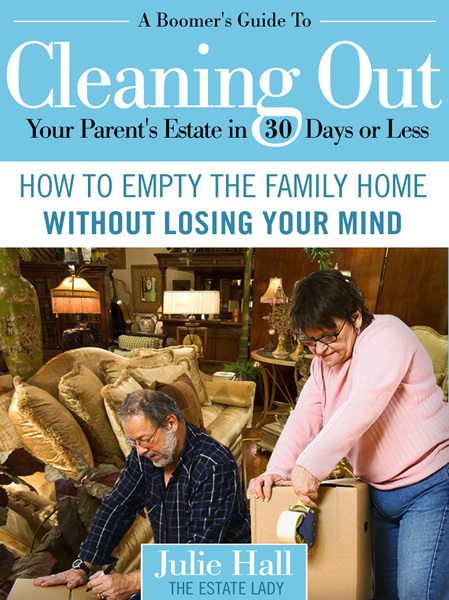 This book includes many worksheets, checklists, and forms you will need to effectively handle cleaning out your parents’ home. I want you to tuck this guide in your pocketbook or briefcase and use it throughout the process: my wisdom and experience at your fingertips. Those of you who have read my first book, or read this blog for very long, know that I want to educate you. That’s my goal! There is a lack of information out there that handles cleaning out an estate, or dividing the estate contents equitably and without fighting. I want to create helpful and very practical guides that cut through to the essentials, and give you all the tools to educate yourself and then do the task effectively. Today, I’m answering a question from a reader. Q: We have a blended family with grown children that are my husband’s, mine, and ours together. We are long retired, the children are grown, and we know it is time to make some serious decisions about our estate and division of heirlooms. For years, two of our children have been bickering over one piece in particular. Naturally we want to be fair, but I think our biggest concern is if one of the children gets an heirloom that doesn’t really belong to them because they are not from that side of the family. How can we handle this delicately? A: About 40% of my clients have challenges with their blended family and personal property distribution. Here are a few basic guidelines; stick with these. Though children grow into adults, they still need our guidance. At this stage, it is vital that you provide your children with precise directions for the time of your death. Offer your children your last wishes, documents regarding heirlooms, Last Will and Testament, Living Will, Health Care Power of Attorney, etc. An attorney can help you prepare these documents, which are absolutely necessary. As for heirlooms, engage in a frank discussion with your husband first. Pull out a notepad and write down all of your decisions regarding all of your children and what you think each one should have. Remember, if you do this for one child, you must do it for all of them. It might be wise to enlist the help of an appraiser/personal property expert to help you ascertain the values of these possessions to keep the distribution financially equivalent for each child. Keep a spreadsheet naming each child, then list the heirlooms that belong to each “bloodline”. Next, call a family meeting with you, your husband, and your children only — No spouses of the children should be present. It is best to do this in person, otherwise, make individual phone calls. Share with your children your wishes and that you have documented who gets what and their current monetary values. Make sure each child gets a copy of this document and make it very clear that there will be no feuding because these are your wishes and decisions. Many clients leave it at that, which I do not recommend. My suggestion is to arrange the transfer of that heirloom to the children while you are alive. This way, fewer “mistakes” can happen after your death, and you will know everyone got everything you wanted them to have. Peace of mind is a beautiful thing!